On behalf of the Board of Trustees, administration, faculty and staff, I would like to welcome you to the American Community Schools of Athens and thank you for entrusting us with the education of your children. The 2018-2019 academic year is my 14th year serving ACS Athens. I am so proud to experience a continuous growth with quality and integrity of our institution in all aspects. Most important, is the fact that all of us are preparing your children to become global citizens with ethos, serving humanity. We have successfully completed the recruiting of Middle School Principal (Melissa George), Academy Principal (Dave Nelson), Elementary School Vice Principal (Valeria Laitinen). In addition, the Dean of Academic & Student Affairs, Dr. Pelonis, recruited two Social Studies faculty, a MS math faculty, OLP specialist. We are in process for finalizing with a psychologist and science person as well. Sophomore group with ten students (starting with 18; 10 successfully completed first years and remaining in Greece). Freshman group with 8-10 students. Phase I: The Middle States Association (MSA) immediately approved us offering 50% of our courses online. Phase II: After the first phase we will apply and receive approval for the degree. We must first offer several courses online before we apply to receive the full curriculum diploma online approval. Widener University and ACS Athens will collaborate to offer a Doctorate degree in Education Leadership focusing on International Education. In the summer of 2020, the first such courses will be offered at the ACS Athens campus. Qualified ACS Athens personnel will be able to teach courses for this program. Widener University and ACS Athens will be offering a Masters in International Education. ACS Athens students will be taking online undergraduate courses with special reduced tuition from Widener University. Qualified ACS Athens faculty will be able to become adjunct faculty. On April 4, 2019, Widener University and ACS Athens will sign the official agreement at a formal ceremony at their campus. In the evening, President Julie Wollman will host a formal dinner at her residence. ACS Athens will be represented by our Board of Trustees Chair, Suheil Sabbagh; Vice Chair, Nick Karambelas; Treasurer, Iraklis Prokopakis; and members Nick Gialamas, Artie Gyftopoulos and myself. Widener University will be represented by its Board Chair, Vice Chair, President, Provost, and senior administration. The Dean of the College of Education and the Director of Graduate Studies of Chapman University will be visiting ACS Athens on February 25th to finalize our recent agreement. President Diarmuid Hegarty and Ms. Catherine Papin, the leadership of Griffith College (Dublin) visited ACS Athens on February 14 and signed an agreement that focused on five areas of collaboration. They were very impressed with our school, its professionals but more importantly our students. The second Summit of the ISCI took place in February at the ACS Athens campus; 400 students participated with teams from the Hisar School (Turkey), American Farm School and ACS Athens. Dr. Miaoulis, who is on the ACS Athens Advisory Board, was the ACS Athens 2013 commencement speaker, the 2016 ACS Athens Colloquium speaker, and a good friend, has been selected to become the President of Roger Williams University. Currently, we have two ACS Athens graduates attending Roger Williams University. Dr. Kevin Ruth, Executive Director of ECIS (European Council of International Schools) will be the high school commencement speaker for 2019. Dr. Ruth oversees an organization with more than 400 international schools that is based in the UK. Mr. Rob Palm has will be the Middle School graduation speaker for this year. 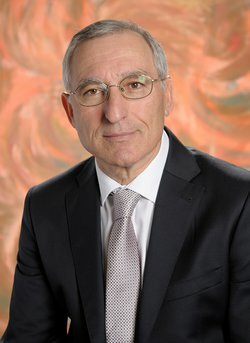 The 2020 ACS Athens commencement speaker will be the Chancellor of the University of Illinois Chicago, Dr. Michael Amiridis, who is a native Greek from Kavala. UIC has a student population of 38,000. Dr. Gialamas was re-appointed as a member of the WISE Prize in Education Committee for 2019. He has been a member of this prestigious organization since 2013. This initiative recognizes and supports an individual or a team for outstanding world-class contribution to education, who receives $500,000 and a gold medal. The Economist magazine recently published its 2019 special issue. Please see the article, “Students of the 21st Century Transforming the World” by Dr. Stefanos Gialamas. The ISJ, which began its publication in 1981 under ECIS and later by John Catt Publications, will begin being published by ACS Athens. It is an honor to continue this platform, which allows educators, professionals, and administrators from K-12 and higher education institutions to connect for the benefit of all learners. Please access the following link. During the first trimester, generally, the class curriculum progresses slowly, especially in math. Many parents feel the need to support their children with more advanced math activities and exercises outside the school hours. How does ACS compare itself with other schools in terms of curriculum and math level in general? What is the philosophy behind the slow progress in this subject? Some new parents feel that their children start school performing very well in this subject although in previous schools they were considered average in terms of performance. - The curriculum at ACS Athens Elementary School is aligned with the AERO Standards that is in complete alignment with the US State Board of Education for the corresponding grade levels (KG- 5). It is specifically designed to spiral around repeated topics including Number Sense, Computation, Operations, Geometry, and Measurement/Time. The scaffolded learning opportunities from year to year allow students to build accuracy, feel successful with their understanding of computational achievements, and apply their learning to real-world problems within our classroom activities, including time in our Dogs In Learning Program. - Mathematics at the ES level is graded, or benchmarked, according to developmentally appropriate activities, or grade level expectations. It is essential that our students are exposed to the curriculum through activities that promote deep thought and provide students with adequate opportunities to construct their learning, along with a plethora of time to express their understanding orally. Learning through these experiences better equips students for defending, clarifying and even justifying their individual thought process and computational approaches. - Our methodology in the ES includes preparing students for both applications of skills and understanding and identifying a correct process when solving problems. Providing learning opportunities within a class such as a journal entry, explaining a process verbally, building or drawing a diagram only strengthens a child's perception of mathematics applied to daily life. In addition to this, if and when students make mistakes, these are opportunities for children to persevere, and work on clarifying why an error was made. Students who understand their mistakes are able to retain and apply their knowledge to latter problems. - On the contrary, it is completely against the grain of any elementary mathematics program to introduce 'advanced activities' outside the curriculum/grade level in the early years as it can ricochet and create a negative self-image of this subject. As the ES faculty focused on Carol Dweck's work, a psychologist from Stanford University, we understand it is more important to develop a stronger awareness that errors will be made in our math classes, but it the assumptions that some students are good in maths, while others don't get it, is what we are working towards avoiding. All students have the capacity for learning math and allowing them to exercise their brains and providing the repetition of scaffolded skills, introducing skills at the right time and helping students feel strong in this subject is creating students who engage in challenging activities because they recognize their attempts will be successful. Parents would like to know if there is a possibility of providing a third language for elementary school students maybe starting 3rd grade. As we are an international school, this option would be very interesting to many families who come from different environments especially that children can easily learn many languages starting from a very young age. In addition, international families can have an option other than Greek or Arabic. We used to offer French in the Elementary School as well as Greek and Arabic, and I would be pleased if we could offer another language besides Greek and Arabic. However, this may be problematic. Because of a mandate from the Greek Ministry of Education, all students with Greek citizenship need to take Greek from K-12. We also have a considerable number of students of Arabic background who wish to study Arabic. This leaves a group of international students who may wish to study another language, such as French or Spanish. The question is whether there are enough of these students to make another language course feasible. Perhaps we could do a survey to see how much interest there is in creating a third language class in the Elementary School and decide if it is something ACS might consider. building a dog house and solving the suggested area allotted for the type of dog. Many parents do not have an ACS parent card or have an expired one. Why haven’t new parents received their ACS cards although their pictures were taken during the registration week? It would be beneficial to have all parents wear their IDs while on campus or upon entry/exit. This would be an added value to the level of security. It has been brought to parents’ attention by the children that the bathrooms are not clean during the day. What is the cleaning procedure in the school? How often do bathrooms get cleaned? How often are they being checked? The same applies to the cafeteria. The kindergarten playground is always damp even on warm days which attracts mosquitoes and poses a health hazard, especially for young kids. How often does this playground get sprayed and why is the mosquito problem not getting solved? Although this playground has been renovated with new grass. During the day (school hours) we clean and check all the restrooms two times per day and another one (thorough cleaning) in late afternoon as part of the daily contracted cleaning services. In addition to above, the restrooms in MS (for girls), administration building, Main Library and Maintenance area (wc used by parents) are cleaned 3-4 times per day during the school hours because of the increased use. KG playground is wet for two reasons. First, it is a grass area and needs a lot of water so it could not be completely dry in the morning. We continuously improve the playground because there is a water sewer under it. About mosquitoes, we spray against them in spring and summer, when the problem begins. However this year there was a sort of outbreak in Athens because public authorities did not spray against mosquitoes adequately and the population of the mosquitoes increased dramatically, affecting ACS as well. Spraying on a small scale (locally) can help but does not eliminate the problem. What is mentioned in topic 6, concerns the cleaning during the day, not the everyday afternoon cleaning. During the day, cleaning is being done by a full-time person and we have added to her, for particular areas, some assistance. All WC's in the campus are checked for toilet papers needs or other needs. the four KG classrooms are cleaned after breakfast. All WC's in the campus are checked and cleaned. the four KG classrooms are cleaned after lunch. Kitchen in Administration building is cleaned. WC in Administration building is cleaned. In addition, we have added extra cleaning during the day by the other cleaning lady (in athletic areas) for certain areas that have increased needs. During the past months, we received three times were concerns, regarding the WC in maintenance area maintenance (parents use it), Library and WC girls in MS. That was the reason we took corrective action to manage the increased needs and added extra cleaning for these spaces during the day by the other cleaning lady (athletics). At ACS, we have a lot of kids that wish to study in the USA. For being admitted at a college in the US, predictions (at the beginning of IB2) play a very important role. We keep hearing however that ACS is extremely strict with predictions and does not “increase/support” even slightly the IB predictions. Other Greek schools with IB programs increase significantly the prediction grade in order to support their children in getting admitted, and every year those schools manage to send lots of kids to very good colleges. Why not ACS? In addition, would it be possible for ACS to provide SAT courses for an additional cost? They can be given after school or on Saturdays. Or a SAT intensive course just before the actual exam dates. Would the school consider adding after-school tutoring ideally with the same teachers that teach IB with the IB subjects such as Math and Physics? That would be very helpful as many students already seek help outside of school. IB predictions need to be as accurate as possible and consistent to ACS grades on Skyward in order to give college admissions advantage to our students. For those going to the USA, IB predictions need to be consistent with their ACS grades as universities look both at the transcripts and IB predictions. Normally, students with high grades on the ACS scale have also high predictions. Thus, here consistency is very important. For those applying to the UK, IB predictions need to be accurate and achievable in order to ensure that students will be able to meet their conditions. For IB Diploma students, UK colleges do not consider ACS grades and place their conditions based on the predictions. Admission in UK colleges is thus ensured only when students achieve their conditions which require that IB predictions are as accurate as possible. Greek IB schools have had in the past very many of their students looking for a college placement through clearing and negotiations after the IB results were released. Our records indicate that with the prediction rubric we apply now, almost all of our students achieve their college choices without having to go through another round of applications in August. There is a lot of informal help given to students taking the SAT subject tests (SAT II) in Math and Physics and many students get help at the studio with SAT 1. Many students taking the subject exams spend many afternoons with me practicing SAT questions in both Math and Physics. Especially for Physics they receive a booklet that I have written that is focused specifically on this exam. As far as I understand it, this has to stay informal because we are a testing center. I remember Steve Medeiros saying that we cannot appear to be providing SAT courses because of this reason. As far as the tutoring after school request goes, I am not sure if that will help much. It will be just another lesson. Students seem to have a completely different philosophy when they are in a school class from that in a private lesson.